Grandma’s Herbs MENOPAUSE is an natural remedy for menopausal symptoms. 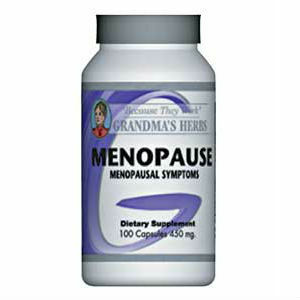 MENOPAUSE is an herbal supplement that aids with hormonal balance that is often associated with menopause. Tired of the unpleasant “symptoms” of menopause? Our MENOPAUSE combination contains Black Cohosh along with many other herbs to reduce hot flashes, combat night sweats and help with tension and mood swings. Take 1 to 2 capsules twice a day. More can be taken if needed. $15.26 for 100 capsules (a 50 day supply) with free shipping. The product vendor offers a return policy with a full money back guarantee for products returned within 14 days of purchase. The product source also includes a contact phone number and a number or product testimonials. The product price is moderate for 100 tablets with free shipping compared to other similar products. The vendor also has product return policy if a purchaser is not satisfied with the product. Consequently a purchaser is not taking an expensive risk to try this product although having a health service provider review the product before purchase would still be a wise option to consider. Jackie Horowitz	reviewed Grandma's Herbs	on September 5th	 and gave it a rating of 2.